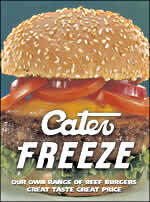 Caterfreeze is the leading independent supplier of frozen food in East Anglia . Being on our customers doorstep means we can offer a fast, friendly and efficient service. And as a family company we understand whats important to our customers and keep in touch with your needs. Its never been harder to make a success in catering, but we can make sure you have the best possible chance, by offering the right products, at the right prices reliably time after time. Carefully chosen products from leading brands and local suppliers.